What an adventure I had! 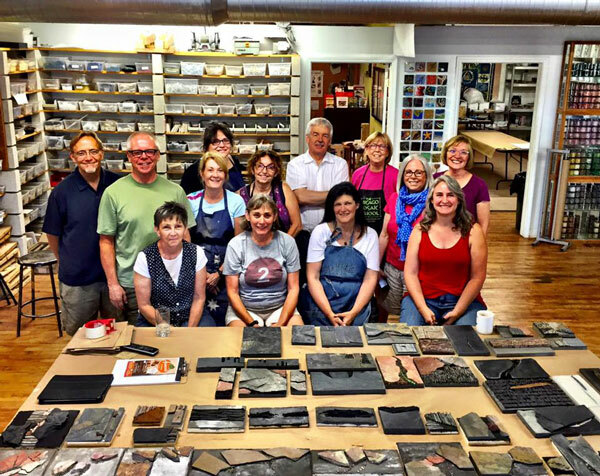 I travelled to Chicago with my friends and mosaic artist colleagues Karen Rycheck and Scott Fitzwater July 7 - 13 to attend a 5-day intensive workshop taught by Scottish artist Dugald MacInnes. The three of us have admired his work for a long time, and had made plans to attend this coveted workshop way back in December! We were not disappointed. 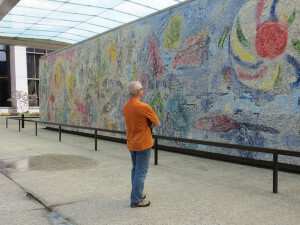 The Chicago Mosaic School was founded by Karen Ami 10 years ago. I'd been there on two previous occasions: for a one day workshop with maestro Verdiano Marzi as a part of the SAMA conference in 2010, and then again 2011 when Bob and I were on vacation. We were able to visit on a day when resident educational director Matteo Randi was giving a talk. 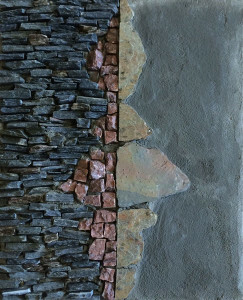 The school is a great resource for mosaic artists as they host a number of well-known international artists for workshops, as well as have a full slate of ongoing classes. Dugald (or Dugie as we learned we could call him!) 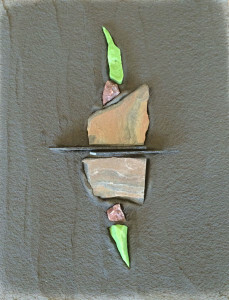 has been working with his native Scottish slate to create amazing works of art for many years. Back in 2009 when I co-curated the special exhibition on mosaics at the Lake Oswego Festival of the Arts, Dugie was one of the artists we chose to show in the invitational portion of the exhibition. So when he saw my name tag on the first day of the workshop, he looked at me with a puzzled expression and said, "I know your name!" and I remembered about the Cutting Edges exhibition! Dugie is a fabulous instructor. He gently guided us to explore the properties and beauty of slate and shale, and the mantra during our 5 days was Simplify! I amazed myself that I was able to create 10 pieces during the course. It was a wonderful exploration. My eyes are open to new possibilities, and I am anxious to get back into my studio to create new work. Here's a photo journey of our trip. Two happy workshop participants on day one. Third piece I did. Moving towards simplicity. 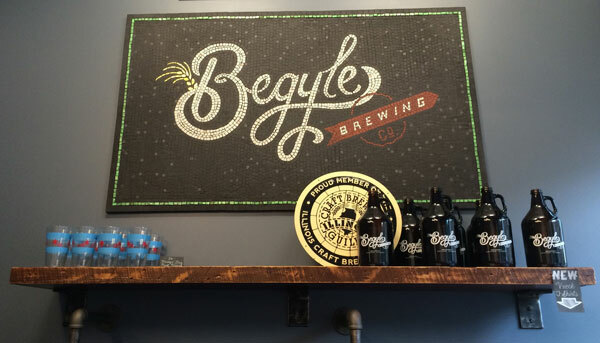 Conveniently located next door to the school, a brewery taproom for us to visit! Mosaic sign by a CMS workshop lead by visiting artist Gary Drostle. After a hard day at work, cheers! Everybody's work laid out on tables for the last day. Final group photo. Dugie is in the white shirt in the back row. Karen and me out for dinner one evening. Time for a selfie while we waited for a table! Karen and Scott downtown by a Calder sculpture. We had Monday free for a bit of exploring before heading to the airport. 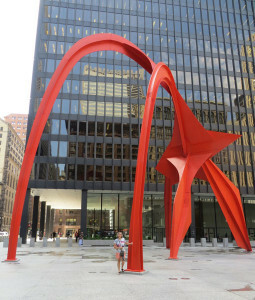 Me with the whole Calder sculpture. 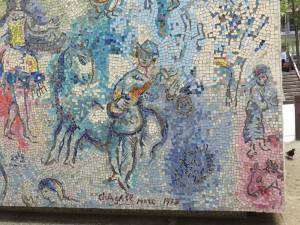 Detail of the Marc Chagall "Four Seasons" mosaic. It's a really big 4-sided thing. Landing in Portland. Awesome trip!